A spine is a really powerful network design idea that takes a moment to explain. 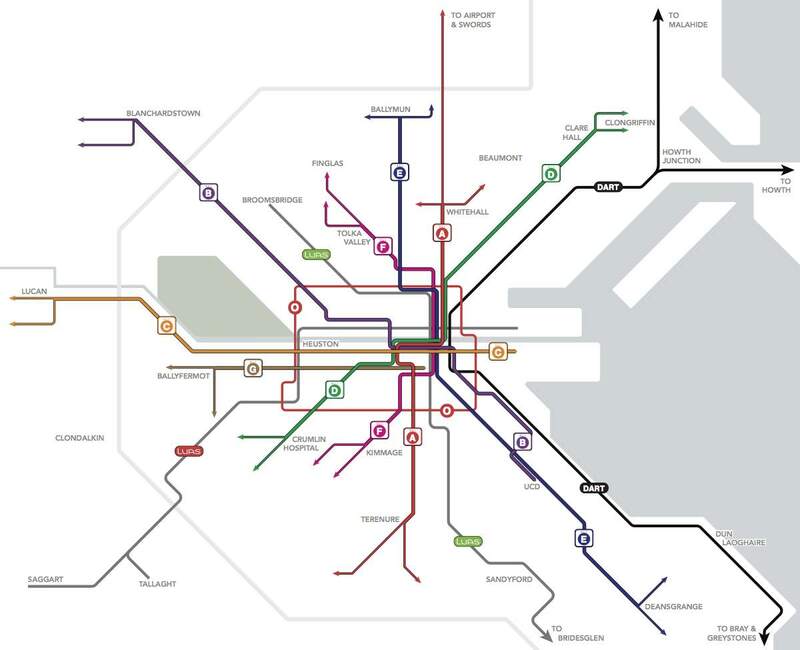 This is how a spine works, in an example from the Dublin bus network redesign proposal. A spine is several bus lines designed to share a common segment, with the buses evenly spaced on that segment to deliver a very high frequency. In this case, each spine branch runs every 15 minutes all day, so the common segment is every 3.75 minutes on average. If you are in the inner city, where all the spines are running on their common segment, you just say “take any bus whose number starts with A”. 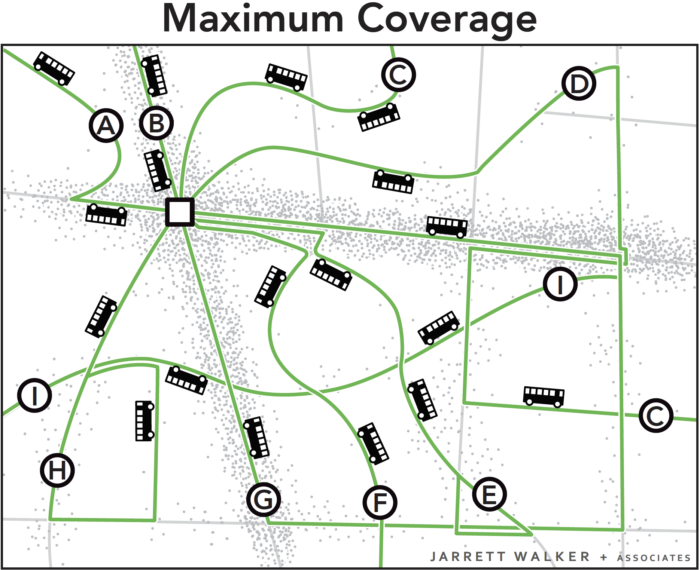 The result is a high-frequency network map that’s easy to draw a map of, and to learn, remember, and explain. In the case of the A spine, all four branches are every 15 minutes all day so the common segment is a little better than every 4 minutes all day. The National Transport Authority also did an animation, here. Many, many cities have a geography where this structure makes sense. As you move out from the centre, the area to be covered gets wider but the frequency need gets lower, so you branch. But you make it legible. The inner city needs an extremely frequent line that’s easy to learn and remember, so we just explain that the A-spine is made of all the buses whose numbers start with A. Presto. You have a simple network of inner-city lines where the bus is always coming soon, exactly what people moving around in the core need. Once you understand it, it’s simple. But it takes a moment to learn, and different people learn it differently. When presenting a plan, I’ll sometimes be asked to count bus routes. How many bus routes change in the plan? 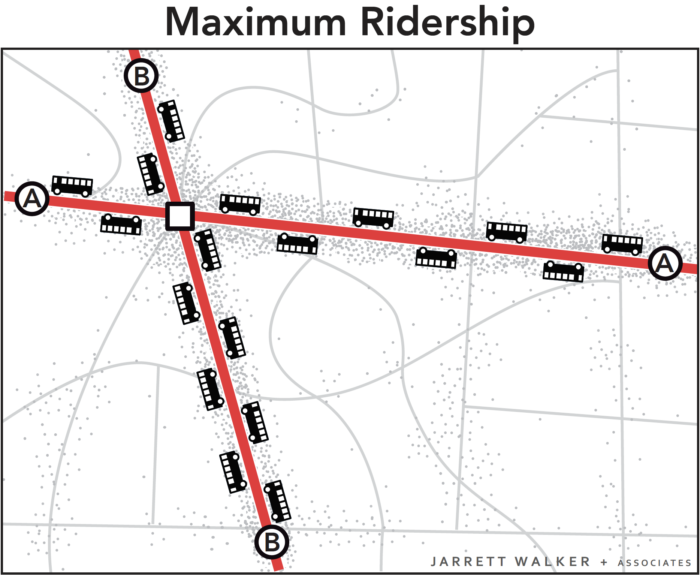 How many bus routes still go into the urban core? These questions have nothing to do with the quality or quantity of transit service. They have nothing to do with anyone’s ability to get anywhere, or even with how much the service is changing. 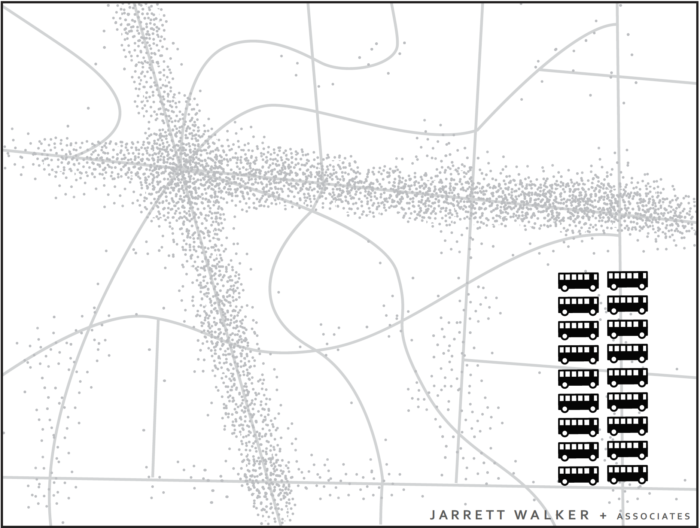 The number of bus routes measures one thing only: the complexity of the service. A bus route is a path followed by some number of buses during the day. A route may be followed by one bus a day or by a bus every two minutes; either way, it counts as one route. The number of bus routes can also be changed by how they are named or numbered. Say a bus route is mostly the same but has a branch on one end, where some buses go one way and some go the other. Is that one bus route or two? The answer to that question changes the number of bus routes, even though the service itself is identical in either case. If you want to talk about service quantity, the correct unit is service hours (or service km), where this means one bus operating in service for an hour (or km). Why count bus routes then? Only if you are making a point about complexity. The number of routes in a network is a measure of how complicated the service is. In this post, for example, I show how a three-route system gets everyone where they’re going faster than a nine-route system, with the added benefit that three routes are easier to keep in your head than nine. The more routes a system has, the more complexity you have to remember. Spreading a service budget across more routes also means those routes are less frequent and therefore less useful. And again, the real measure of a network plan is where people can get to in a reasonable amount of time. In the Dublin proposal, for example, the average Dubliner can get to 20% more jobs (counting student enrolments) in 45 minutes. That’s a real expansion in the liberty and opportunity that people experience in their daily lives. Are you sure the number of bus routes matters more than that? Does your transit agency have a recent history of operating speed that looks like this? This is the “boiling frog” problem of bus operating speed. In a dense and growing city, it’s not unusual to see speeds falling by about 1% a year, as in this data for Portland’s busiest lines. If you’re going to analyze how service levels relate to ridership, you have to think about speed. Speed is not just a disadvantage for the customer; slower speeds are also a service cut. You, the customer, want to go a distance, but the transit agency will pay for your service by the hour. So the quantity of service you experience will be governed by how easily hours turn into distance — in other words, by speed. So if a transit agency budget grows by 1% a year but speed is falling 1% a year, the customer should expect slower speed and no other growth in service. When measuring the service quantity that affects ridership, then, look at service miles or km, not service hours. Is your transit agency succeeding? It depends on what it’s trying to do, and most transit agencies haven’t been given clear direction about what they should be trying to do. This post revisits a basic topic at the core of transit planning decisions that everyone engaged in conversation about transit should understand. In the fictional town below, the little dots indicate dwellings and commercial buildings and other land uses. The lines indicate roads. Most of the activity in the town is concentrated around a few roads, as in most towns. Imagine you are the transit planner for this fictional town. The dots scattered around the map are people and jobs. The 18 buses are the resources the town has to run transit. Before you can plan transit routes you must first decide: What is the purpose of your transit system? A transit agency pursuing only a ridership goal would focus service on the streets where there are large numbers of people, where walking to transit stops is easy, and where the straight routes feel direct and fast to customers. Because service is concentrated into fewer routes, frequency is high and a bus is always coming soon. This would result in a network like the one below. All 18 buses are focused on the busiest areas. Waits for service are short but walks to service are longer for people in less populated areas. Frequency and ridership are high, but some places have no service. Why is this the maximum ridership alternative? It has to do with the non-linear payoff of both high density and high frequency, as we explain more fully here. If the town were pursuing only a coverage goal, on the other hand, the transit agency would spread out services so that every street had a bus route, as in the network at below. Spreading it out sounds great, but it also means spreading it thin. As a result, all routes would be infrequent, even those on the main roads. Infrequent service isn’t very useful, so not many people would ride. The 18 buses are spread around so that there is a route on every street. Everyone lives near a stop, but every route is infrequent, so waits for service are long. Only a few people can bear to wait so long, so ridership is low. In these two scenarios, the town is using the same number of buses. These two networks cost the same amount to operate, but they deliver very different outcomes. Reducing environmental impact through lower Vehicle Miles Travelled. Achieving low public subsidy per rider, through serving the more riders with the same resources, and through fares collected from more passengers. Allowing continued urban development, even at higher densities, without being constrained by traffic congestion. Ensuring that everyone has access to some transit service, no matter where they live. Providing lifeline access to critical services for those who cannot drive. Providing access for people with severe needs. Providing a sense of political equity, by providing service to every municipality or electoral district. Ridership and coverage goals are both laudable, but they lead us in opposite directions. Within a fixed budget, if a transit agency wants to do more of one, it must do less of the other. Because of that, cities and transit agencies need to make a clear choice regarding the Ridership-Coverage tradeoff. In fact, we encourage cities to develop consensus on a Service Allocation Policy, which takes the form of a percentage split of resources between the different goals. For example, an agency might decide to allocate 60 percent of its service towards the Ridership Goal and 40 percent towards the Coverage Goal. Our firm has helped many transit agencies think through this question. What about your city? What do you think should be the split between ridership and coverage? The answer will depend on your preferences and values. No two cities are the same. How often have you heard that rush hour is when transit really excels? When you see all those crowded buses and trains, for just two hours or so, it seems like transit’s really proving its value. You must get someone to report to work for a short shift. This usually means that you pay them for more hours than they work. Some agencies are also prohibited, in their labor contracts, from using part time drivers, which are really the only way to serve these short shifts efficiently. Peak demand that flows in only one direction, as in the classic American single-centred city, also generates the huge inefficiency of moving all those vehicles, entirely or mostly empty, back in the reverse-peak direction. The peak determines the number of vehicles that must be owned and maintained. Sometimes, peak ridership is so much higher than midday that the fare revenue makes up for all these inefficiencies, but not always. In fact, my experience with American bus operators is that few of them have really counted the cost of their peak-only services. Transit agencies should know and report the true marginal cost of a peak-only vehicle hour as distinct from an all day vehicle hour (including all-day buses that continue through the peak.) We know peak-only service is expensive, but we’d have much clearer conversations if we knew exactly how much. Basics: Where Can Ferries Succeed? An email from a transit professional asks what I have to say about ferries. Think of a ferry as a rapid transit line, minus the huge cost of land and rails and power supply, but unable to continue across a land-water boundary. Like rail, ferries carry the limitation that everyone has to get off at the end of the line. Obviously you need transit connections there for onward journeys, but the result is multiple connections to continue in one direction, which is always less effective than grid structures where service can flow onward across the city. Ferries, of course, have even more constraints about where the end of the line must be. So ferries often struggle to compete with transit lines using adjacent bridges or tunnels, because these can penetrate deeper into the city on both sides to complete logical networks. Another constraint of ferries is that waterfront land is expensive, so it’s hard to find space at a ferry terminal for everything you’d want at a transit node, including terminals for connecting transit, transit-oriented development, and (if you must) commuter parking. This means that a really successful ferry line, especially all day, has the following necessary conditions. High frequency. This requires minimizing on-board labor, as labor drives operating cost and thus constrains frequency. (Marine regulations in many countries are an obstacle to this.) 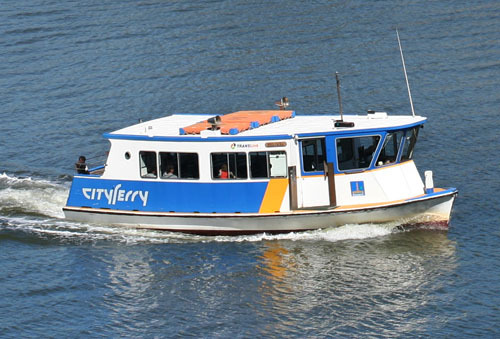 Ferries with only one employee on board achieve frequency through low labor costs. See, for example, the privately owned micro-ferries on Vancouver’s False Creek (really a small, sheltered harbor) or the small cross-river ferries in Brisbane. These can do well with only moderate demand because they are so cheap to operate, and can build up useful frequency for the same reason. Very high density right in walking distance of the ferry terminal, preferably without major grades to climb. 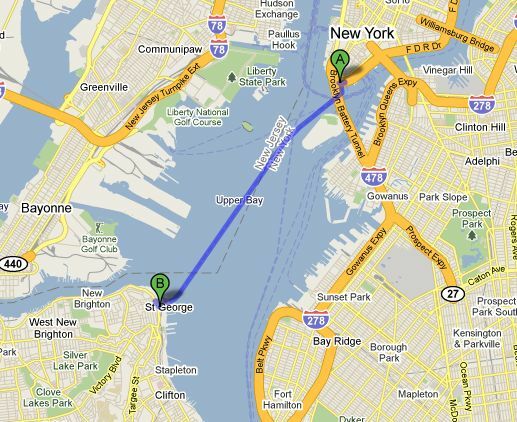 This is a challenge because if you draw a walk-access circle around a ferry terminal, most of it is usually water. Cities that slope upward steeply from the water, like Seattle, present further barriers. Quality landside access by frequent connecting transit modes, sufficient to draw adequate all-day demand. This and the previous one can substitute for each other to a degree, but the most successful services have both. In Hong Kong, for example, there are large bus terminals at the major ferry terminals, despite astronomical land value and the many competing demands, because they really understand the importance of total networks, which in turn are built on easy connections. No competition from bridges or tunnels, especially those carrying frequent transit lines (rail or bus). Ferries just can’t compete, for high volume, with bridge-and-tunnel services. Sometimes ferries are run to densely populated coves where the competing bridge or tunnel lands too far back from the water to serve the area, as on New York’s East River, but in this case you have to fill the ferry solely with waterfront demand, because people inland will take the bridge or tunnel service. Favorable Pricing. If there is any possible competition with bridge/tunnel service, the ferry needs to be cheaper to use, counting the total trip including any connections. The immensely successful Staten Island Ferry has all the necessary features, including huge transit networks converging on both ends. Really successful ferries, like New York’s Staten Island Ferry or Hong Kong’s Star Ferry, have all of these features. The most common problem in ferry planning is to build too many little terminals, each with too small a market, so that they don’t support much service outside of rush hour and often not even then. Auckland and Sydney, for example, have lots of ferry terminals in bucolic suburban coves, downhill from most nearby residents, where there are just not enough people. These tend to become elite services and often not very productive ones. Fewer terminals with larger demand is the key, just as fewer stops is a key to the most productive land-based networks. The romantic and scenic qualities of ferries always generate support, just as happens with rail services, but service must be useful, compared to your alternatives, if it is to succeed long-term. Tourism and recreation are often cited as markets, but unless you have a supercharged tourism sector, and the right kind of service and connections, this market is easily overstated due to inevitable private sector boosterism. As always, if the ridership prospects are low and the benefits are mostly private, the funding should be private as well. Encourage the tourist sector to fund tourist ferries directly, just as you would for any service precision-designed around a single interest. The same could be said for small, low-demand ferries that mostly benefit a single development or specialized community. So yes, ferries are good at certain things, but destinations along the water, and some local enthusiasm, isn’t enough to ensure a successful ferry project. What are Transit Consultants For? This is going to sound a little like marketing, but it answers a common question or objection. Why do you need consultants for your city’s transit plan? Other consultants will speak for themselves, but here’s why you might need a consultant like me. Inevitably, this list is also a definition, in my mind, of what makes a good consultant, at least for transit network design. It’s what we strive for at our firm. Experience with Lots of Cities. Your city is unique, but the facts of geometry, the facts of biology, and many human longings and foibles are the same everywhere, even on other continents. I’ve worked in (or studied) about 100 cities and towns, so I can see exactly what’s unique about your city and exactly what’s just like everywhere else. This perspective is really helpful to locals, who don’t all get to make that comparison every day. In particular, I can help you take some of the fervor out of local arguments by pointing out that many cities, at this moment of history, are having the very same conversation, featuring the same points of view. Ability to Foster Clear Conversations. Because of that experience, we cut through a lot of angry chaos in the local conversation, and frame questions more constructively. This doesn’t mean we make hard decisions go away; in fact we often make them starker. But we also make them clearer, so that if the community makes a decision, they actually understand the consequences of that decision. Maximizing Your Community’s Options. Unlike a lot of consultants, we hate telling communities what they should do. We prefer to show them what their options are, and let them decide. But laying out options is really hard. You have to show exactly where the room to maneuver is where where it isn’t. That requires the next two skills. Clarity about Different Kinds of Certainty. As consultants, we know when we’re in the presence of a geometric fact rather than a cultural assumption or a personal desire. Only when we accept the facts of geometry (and biology, and physics) can we know what a community’s real options are. Ability to Argue from Shared Values. Good transit consultants don’t just talk about peak loads and deadheading and value capture and connection penalties. They also talk about liberty and equality and durability and prosperity and aesthetics. Then, they explain why those big ideas for your city imply that you should care about this or that detail of your transit system. It may turn out that connection penalities are an important issue if you care about liberty and opportunity, but your consultant should be able to explain why. Skill at Synthetic Thinking. Synthetic thinking is the ability to generate insights that solve many problems at once, such as you need to create a scientific theory or design any complex system. Synthesis means “putting things together,” so it’s the exact opposite of analysis, which means taking things apart. Synthesists rely on the work of analysts, but you will never analyze your way to a good network design. The skill of synthetic thinking is impossible to teach and can only be recognized where it appears, but a fondness for thinking abstractly or theoretically is a good indicator of it. And since network design is rarely taught in universities anyway, the best evidence of this skill is a track record of having done it successfully, in lots of cities, plus (very important) the ability to explain it to a diverse range of people. Skill at Spatial Thinking. Finally, the specific kind of synthetic thinking needed for network design is spatial. People who like designing and solving problems in space — architects, military strategists, chess players, visual artists, and kids or adults playing with trains — are likely to be good at it. The biggest transit authorities, in the most transit-sophisticated cities, may have people with all these skills on their staff, because they are questioning and improving their network all the time. But most transit agencies don’t, and that’s understandable. In most cities, you don’t redesign your transit network every day, or even every decade, so it’s inevitable that most of the staff of the transit agency has never done it before. Relatively few transit agency jobs require, on a day-to-day basis, the skills that make for good network designer, especially for large-scale redesign. So those agencies will benefit from some help. Consultant, of course, is a much-sullied word. For one thing, many consultants go around telling people what they should do; we do this as little as possible. Many consultants just teach you to envy other cities, which appeals to certain human desires but is also not the best basis for good decisions. Also, like professionals of any kind, some consultants speak in ways that are incomprehensible to most people, or refuse to explain things clearly, so as to sound wise or authoritative. (“Our proprietary six-step model with a Finkelstein regression says you should build this freeway.”) A transit consultant who can’t make a reasonably intelligent and open-minded person understand their work isn’t one you should trust — especially when it comes to network design. See, network design is like chess. The rules are pretty simple. I explained them in my book Human Transit and I keep trying to improve on those explanations, here for example. But doing it is hard, and you can spend years getting better at it. So it helps to have someone at the table who has done it many times, who knows how to see the patterns of opportunity in your city’s geography, and who can explain why an idea works, or doesn’t. Toronto’s new high-fare, elite train between downtown and the airport is a failure in ridership terms, so it’s a good moment to talk about transit to the airport in general. This critique by Cherise Burda of Ryerson University, one of the Toronto line’s few regular riders, pretty much sums up why the Toronto Union Pearson Express is doing so poorly: Fares too high (CAD $27.50 one way) for a line that just doesn’t connect the airport to enough places. 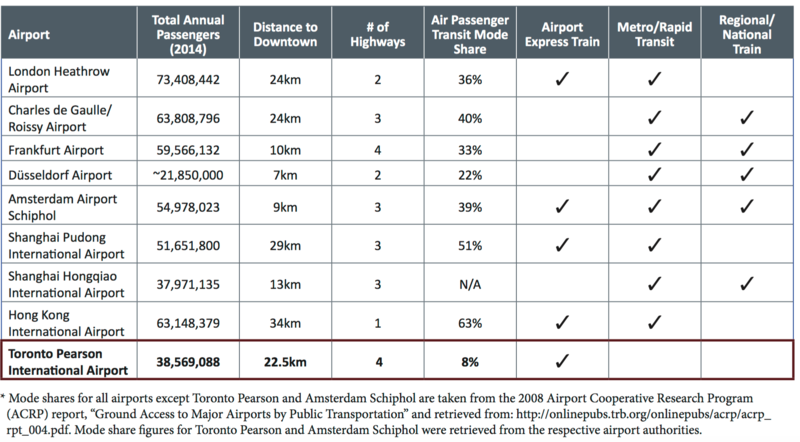 She also shares this very useful table from the recent Pearson Connects study, a transport plan for Toronto’s main airport by Urban Strategies, Inc. Focus on the four columns at the right. Do you think that specialized airport express trains are the key to high transit mode share to an airport? Think again. What matters is not just the train to downtown, but the whole transit network and the airport’s position in it. Where can you get to on that network, and how soon? (A true assessment of this issue would have included bus services too, of course.) London’s Heathrow, for example, has a high-fare express train very much like Toronto’s, but it also has a slower train that makes more stops for a lower fare, and a subway line that makes even more stops and serves even more places. Those lines connect to more services, and are therefore more useful to far more people. Basic math: 1000 airport employees using an airport service every day are more ridership than 100,000 air travelers using it, on average, maybe a couple of times a year. This is the simple reason that airport transit politics are so frustrating. Everyone wants to believe in transit to the airport, because they might ride it a few times a year. But to create a great airport train (or bus) for air travelers, you have to make it useful to airport employees too That generally means a service that’s an integral part of the regional transit network, not a specialized airport train. The other key issue is that most airports are cul-de-sacs. It’s hard for a line to continue beyond the airport unless it’s underground, and this is another huge limitation on an airport service’s ability to serve a sufficiently diverse market. If you can afford it, aspire to be like Sydney, whose rapid transit system tunnels under the airport so that it can continue beyond it without branching. And if you’re a rare airport like Seattle’s, where surface transit can stop at the terminal but continue onward, so much the better. Total travel time matters, not just in-vehicle time. Airports are citadels of impatience. Travel time matters hugely, but travel time is not just in-vehicle time (the time you’ll see advertised) but total time including waiting. That’s why the advantage of making few stops is wildly exaggerated. To accurately measure real travel time, add the in-vehicle travel time to half the waiting time, where the latter is governed by frequency. You may find that a more frequent train that stops more often (and is therefore useful to more people) comes out ahead even for the downtown-to-airport traveler. Combine air travelers and airport employees on the same train/bus, and appeal to an economically diverse range of air travelers, not just the elite. This is a case of the general principle that transit thrives on the diversity of trips for which it’s useful, not on specialization. If elites want a nicer train, give them first class cars at higher fares, but not a separate train just for them. (And as always, elite services are a good role for the for-profit sector.) As always, the more people of all kinds you can get on a train or bus, the more frequently you can afford to run it, which means less waiting, and the lower the fare you need to charge. Connect the airport to lots of places, not just downtown, by providing a total network. It’s the total transit system at the airport, not just the airport-downtown express line, that determines who can get there, and how quickly. And the total network requires connections — another reason to care about frequency. Don’t interfere with the growth of other services. Airport terminals are still not huge destinations by citywide standards, so don’t sacrifice other major markets to serve them. Toronto’s airport train, for example, not only carries few people but creates issues for higher-ridership services with which it shares track. Another common problem is the branch into the airport that cuts frequency and capacity on a mainline, even though the mainline’s demand is much higher than the airport’s (San Francisco, Vancouver). If you can afford it, go via the airport instead of terminating there. Most airports are large-scale cul-de-sacs, and like every cul-de-sac, they say: “I want only as much transit service as I can justify all by myself.” So if you can tunnel under the airport and serve it on the way to other places, as in Sydney, you will often end up with much better service for all your airport users, employees and travelers alike. When you hear the word integration in conversations about transit, it usually means making it easy to make trips that involve multiple transit agencies that are geographically connected or entangled. Another common word is seamlessness, which I like because it evokes the image of a well-made complete object. The report discusses practical integration problems like navigation and fare payment, explores different solutions suitable to each, and tries to show how much can be achieved without huge mergers. The report points out bleedingly obvious solutions politely enough that not everyone will hear the subtext, which is “Why wasn’t this done 50 years ago?” The lack of a customer-oriented regional transit map is in this category. Such maps as exist are more like diagrams of turf — the sort of map you include in a peace treaty. They’re designed to clarify what agency controls what rather than help people understand their travel options. There is little discussion of creating a giant regional transit agency, or indeed of mergers in general. The report accepts that while the existing patchwork is not what anyone would design from scratch, it is achieving a balance between the ability to work over a large area and the ability to act locally on local issues. Too many integration discussions jump too quickly to hugeness as the answer. For decades, it’s been easy to propose that some grand merger of agencies would solve problems of integration, but the obvious problem was you would have to merge the whole Bay Area into one transit authority serving almost 8 million people, in a region around 100 miles long. That population would mean little citizen access to the leadership, while the huge area would mean that people planning your bus routes may be working in an office 50 miles away. It just doesn’t work when the sense of citizenship is as understandably decentralized as it is in the Bay Area. Many North American regions are seeing conflict around this issue, and are evolving a fascinating range of solutions. Many of these solutions involve additional funding from the cities that want more transit than the regional average. Some core cities are proud to have their own city-controlled transit systems separate from what regional agencies do (San Francisco, Toronto, Chicago). Some pay their regional transit agency for a higher level of service in the core city (Seattle). Some run their own transit systems overlaid, often messily and confusingly, on the regional one (Washington DC). Many more core cities are going to face this issue soon, especially if regional politics continue to polarize on urban-exurban lines. Apart from the issue of urban-exurban differences in the need for transit, there are also real challenges when a single transit agency becomes enormous, especially if it provides local service over a vast geographic area. Los Angeles is a great example. As an undergraduate in the 1980s, living in the region, I marveled at what I assumed to be the stupid chaos of provincialism. The region had a big transit agency, which has evolved into what we now call LA Metro, but many cities within the region ran their own transit systems, which were tangled up in each other, and with the regional agency, in complex ways. As an undergraduate, I assumed that progress would mean merging all this into one giant agency that could provide the same product everywhere. And yet: in those days, everyone hated the regional agency, but loved their city ones. And there were good reasons for that that weren’t anyone’s fault, and still aren’t today. You could get your city’s transit manager on the phone, but not the regional one. Small city governments can fix a bus route and put up a new bus shelter in the time it would take the regional agency to organize the right series of meetings. Again, nobody’s at fault there; these are natural consequences of smallness and bigness — in corporations as well as in governments. Which is why, even in Los Angeles, the trend is not toward mergers. Today, many city systems in the county are doing excellent work at their local scale. LA Metro has improved massively as well, of course, but its costs are still high; more important, it’s still very big and therefore inevitably feels distant to many people — again, not the fault of the folks working there. So there’s no simple answer. City control creates a nasty patchwork of geographic integration problems across adjacent cities in a region. The big regional agency has a different integration problem, which is with the land use and street design functions of municipal governments that don’t control their transit and therefore have trouble caring about it. Whichever thing you integrate, you’re disintegrating the other. Neighbors have an easier time being friendly if they have a very clear agreement about where their boundary is. Collaborating with your neighbor to mark the boundary, and fence it if need be, is a peacemaking gesture. This is as true of neighboring landowners as it is of nations. And it’s certainly true of transit agencies. What does it mean to have a clear sense of boundary? It’s not just that both sides agree where the boundary is. It’s also that it’s easy for both sides to live with the boundary, and work across it as need be. For nations, it’s much easier to manage a boundary that runs across a natural barrier, so that the natural boundary reinforces the agreed boundary — the Rio Grande River between the US and Mexico, say, or the Great Lakes along the US-Canada border. The worst possible national boundary is something like the 49th parallel, the US-Canada border in western North America, an arbitrary line that runs perpendicular to most mountains and valleys. Only the extreme friendship and cultural affinity between the two countries makes this boundary workable. All that is true of transit agencies as well. Let’s talk first about local networks, and then, separately, about the relationship between networks of different scales. A bank of hills or a water body means that there are limited points of access across the boundary, called chokepoints, and this in turn means people are used to going out of their way to cross that point. That means, in turn, that a well-placed transit connection point adjacent to the bridge or pass is an easy place for transit agencies on the two sides to converge. On the other hand, a boundary that runs across a flat expanse of urban area, so that many people are literally across the street from the other side, is a problematic transit boundary. In this case there is decentralized demand in all directions crossing the boundary at many points. This makes it harder to bring both agencies to a shared focal point for connections between the agencies. It also means there are lots of relatively short trips flowing over the border, and these benefit from a continuous network of service rather than an interrupted one. As in many US states, California transit agency boundaries tend to default to county lines, and where these create that problem, it’s a mess for transit. Some of this wisdom is already encoded in the boundaries of the East Bay agency AC Transit. Near the Bay, the border between Alameda and Contra Costa counties cuts across dense urban fabric, so it would be an awful place for a transit network to end from the point of view of either side. Recognizing this, AC Transit was constructed to unite the two sides of the county line where the urban fabric was continuous, while dividing from other agencies along natural hill and water boundaries, even where the latter are not county lines. This is an important example for many US regions where counties are the default planning units, and arbitrary boundaries drawn in the 19th century (or before) risk turning into walls that sever transit access. For AC Transit, the “good fences” solution was to put the border in a place that worked well for both sides — worked well for transit customers, that is, not for anyone’s desire for turf or empire. That tends to mean looking for the natural chokepoint and putting the boundary there. This observation also helps to clarify the city transit option. Even in big urban areas, some cities have a geography that makes it easy for much of the transit to be city-controlled, typically because of natural chokepoints along the edges that help isolate the city-scale network from the regional one. On the other hand, if the city boundary is logically pierced by long, straight local transit corridors that logically function both within the city and beyond it, a municipal network is less viable. Burbank, California is a good example of a city where most main streets are parts of much longer logical lines running deep into adjacent cities, so its city limits would make especially poor transit boundaries. Burbank therefore profits from its reliance on LA Metro, which runs long, continuous lines across city boundaries many of them converging on Burbank’s downtown. The regional network is also, logically, the local one. Nearby Pasadena (considered together with Altadena) has good geography for a larger city role. It has hill barriers on three sides — only the east edge is really continuous with other dense urban fabric — so fewer of its internal corridors necessarily flow into other cities. (Tip: cities whose density is so low that they might as well be wilderness as far as transit is concerned — San Marino in this case — count as natural barriers to some degree.) Another important feature is that Pasadena has a frequent regional rapid transit line running through, so its local lines don’t need to extend far out of the city to make regional connections. So Pasadena could run most of its local transit system if it wanted to, because a logical network would consist mostly of internal routes. Burbank could not, because most of its local service is logically proivded by routes that continue beyond the city limits. Do not cite me saying that Pasadena’s transit should be more local. I am not saying anything about what the regional-local balance should be in these cases, but merely observing how the geography makes the opportunities larger or smaller. One value of Pasadena being served by the regional agency, for example, is that it can eventually be part of a larger high-frequency grid, with all the liberty that brings. All that is about what happens between local networks. But another “good fence” can be a clear division of labor between local and regional services. Regional services that are designed as rapid transit (widely spaced stations for fast operation between them, relying on local transit connections to get closer to most destinations) do not need to be the same agency as the local service meeting them; in fact, this can be a very clean “fence.” Obviously you have to work on the specific problems of integration: information, fares, etc., just as adjacent local agencies do. But there’s little need to merge or change boundaries in these situations. All this is to say that the SPUR report is excellent, but that the organization of transit agencies, and especially of their boundaries or seams, needs to respect the geography of demand — as inherited county lines in the US do not always do. We’ve also arrived at a more realistic notion of “seamlessness.” There will always be seams in a transit journey, just as there will always be the need to make connections. The conversation should not be about how to get rid of seams but how to put them in the right places, so that they work for both sides, and how to manage them so that travelers can flow through them easily. Another way of thinking about the geographic issues I’ve been laying out here is that if you require a connection to continue your trip, there should be a rich payoff in terms of destinations you can reach. The same is true for any hassles created by seams. It’s like planes: it’s a drag to change planes, and especially to change between airlines, but it’s kind of cool, while you are changing planes, to look at the departure planes and think about all the other places you could also get to via this connection. What’s more, all those connections are crucial to making your flights viable for the airline, even if you don’t use them. The logic of connections is the logic of good seams in general. They happen in places where it’s already logical for transit services to be discontinuous — either because of a natural boundary or because of a clear division of labor between regional and local service. Those “good fences”, once found, can make for happy neighboring transit authorities, which will find it easy to work together for the sake of the customer’s liberty. Sure, let’s regionalize the right things: fare media, information systems. (An often-neglected one is service change dates, so that timed connections between agencies don’t get broken because the agencies change their schedules at different times.) Some mergers may make sense, such as between BART and Caltrain to create a regional rapid transit agency. Big transit agencies and little ones are both excellent things. The trick is to get the fence right. UPDATE: For a book-length academic analysis reaching a similar view, see Donald Chisholm: Coordination without Hierarchy. 1992, UC Press. H/t David King. This article has moved to here. <– Click here.